Project planning is a diverse and many-faceted discipline that requires an equally diverse set of tools. 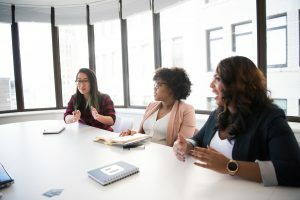 In this article, we’ll break down the project planning process into its 7 main activities — from brainstorming to knowledge management — and look at the best tools for each activity currently available on the market. Traditional text documents are still the best format for many deliverables created during the project planning phase, such as reports, vision statements and formal project plans. Modern, cloud-based writing tools enable you to share documents with other decision makers efficiently and collaborate on them in real-time. 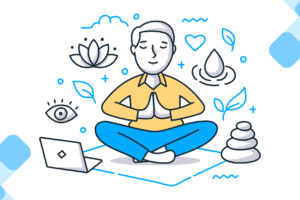 Three of the best and most widely used online writing apps are Google Docs, Microsoft Word Online, and Dropbox Paper, all of which are simple, clean and — with certain limitations — available for free. Google Docs: Docs is available as part of G Suite — Google’s productivity suite of web-based apps. It’s a solid word processor that lets you work together on documents, leave comments, and even turn comments into tasks that you can assign to a collaborator. Docs also offers a number of great add-ons. Microsoft Word Online: Similarly to Docs, Microsoft Word Online comes as part of a package — the Microsoft Office 365 Suite. You can save your documents on OneDrive and share them easily with a secure share link. 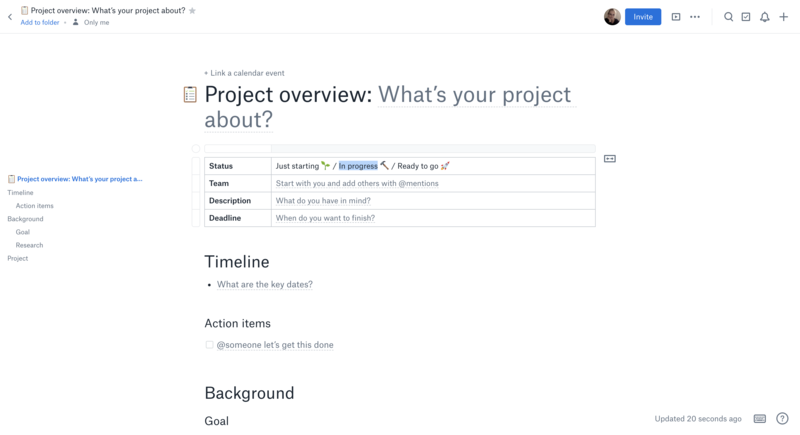 Dropbox Paper: Compared to Docs and Word, Dropbox Paper is a very sleek and modern looking text editor that focuses on distraction-free writing. It aims to simplify things like pasting videos and formatting images, and overall feels very intuitive. However, the app’s minimalism also applies to features and formatting options, so if your needs are more advanced, Docs or Word is still the better choice. 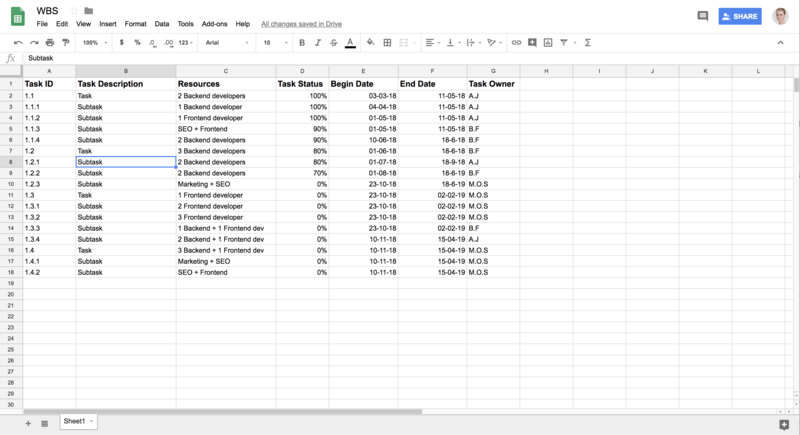 Whether you’re creating a work breakdown structure (WBS) or are working on your budget calculations, spreadsheets are an essential part of any project planning process. In 2018, all top players in the spreadsheet market are either cloud-based or at least offer cloud-based versions, enabling you to share sheets easily and collaborate with other team members. Microsoft Excel: Having been the industry standard since the 90s, Microsoft Excel is widely used across the globe and a solid choice for project managers. Excel can still be purchased and installed locally, but also offers a cloud-based version as part of Office 365. Google Sheets: If your organization works with G Suite, then Sheets is the obvious choice to cover your spreadsheet needs. The tool also offers a variety of practical templates, and comes with a whole marketplace full of powerful add-ons to make your life easier. If the data visualization options inside your spreadsheet tools aren’t enough, you might want to look for a more specialized chart maker to create your pie charts, bar graphs, infographics and other visual reports. Infogram: This web-based chart maker lets you create engaging infographics and reports. They offer more than 35 charts and 500 maps, 1 million images and icons, practical templates and more. Plotly: Plotly is a great choice if your needs are more advanced — it’s marketed towards data scientists and analysts and offers next-level visualizations for your business. Visme: Visme lets you create presentations, infographics and other visual content. 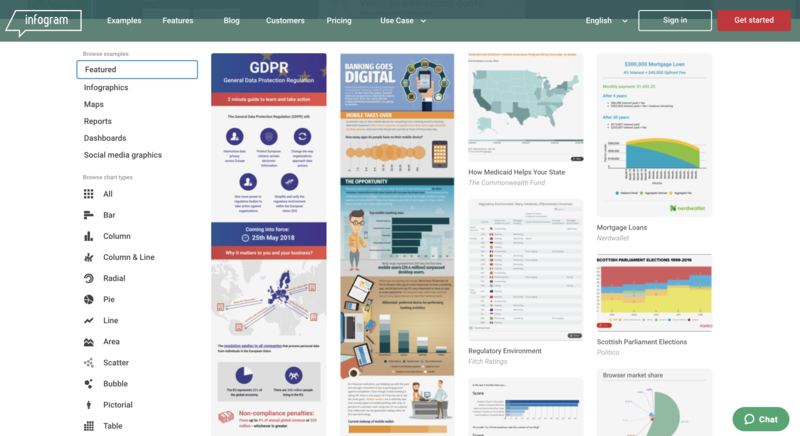 The tool offers a vast library of templates, images and icons, so you can put together an engaging infographic in no time. Bonus: Google Charts: As part of your project communication efforts, you might want to enable stakeholders to view data live on your site. Google Charts lets you create interactive charts for browsers and mobile devices, which are updated based on your data in real-time. Similarly to chart makers and diagram tools, the apps in this category enable you to communicate information visually. 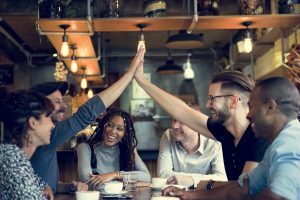 However, this time the focus is on the collaborative process: the ability to come together as a team — be it virtually or in-person — and work together in a shared space. Typical uses of visual collaboration tools are brainstorming, decision making and collaborative planning. 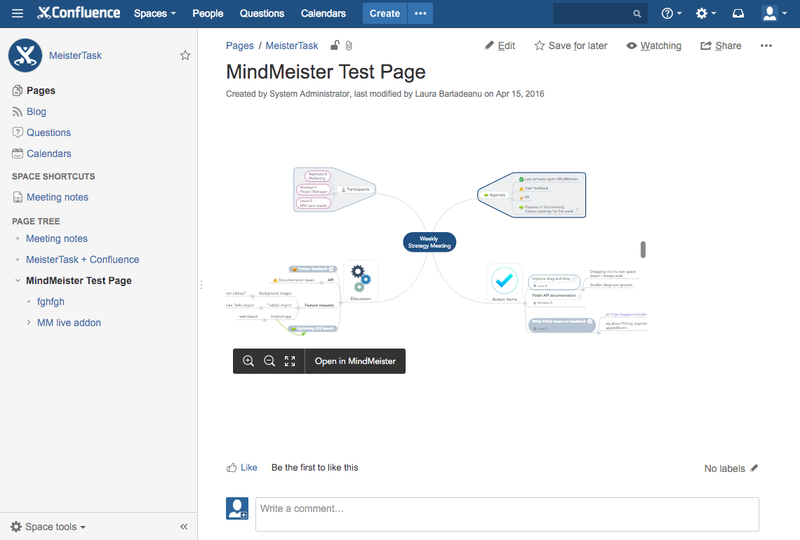 MindMeister: MindMeister lets you collaborate on shared mind maps with an unlimited number of colleagues. The intuitive interface is ideal for ad-hoc brainstorming sessions, strategizing, project planning and decision making. 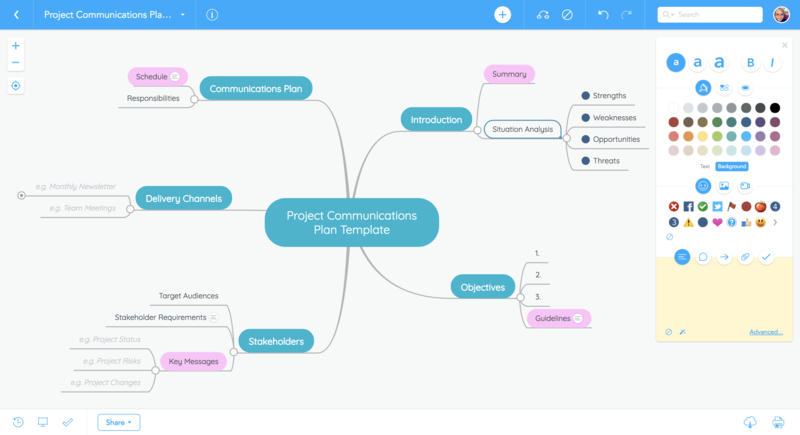 MindMeister also offers mobile apps for iOS and Android, which allow you to access your mind maps while you’re offline. Miro: Miro (formerly known as Realtime Board) is a versatile online whiteboard software that offers many practical integrations, for instance with Atlassian products. The software runs inside your browser, on Desktop and mobile devices. Mural: Mural lets you draw or type ideas on virtual sticky notes, add visuals in the form of images and videos, and collaborate on them with your team members in real-time. It’s a simple and straightforward collaboration software similar to Realtime Board. Visio Online: Developed by Microsoft, Visio Online is a professional and sophisticated diagram tool that allows real-time collaboration between users and lets you create anything from flow charts to timelines and from floor plans to business processes. Lucidchart: Beside the standard selection of diagram types, Lucidchart also works as a wireframe and mockup tool and offers specialized diagrams for engineers. 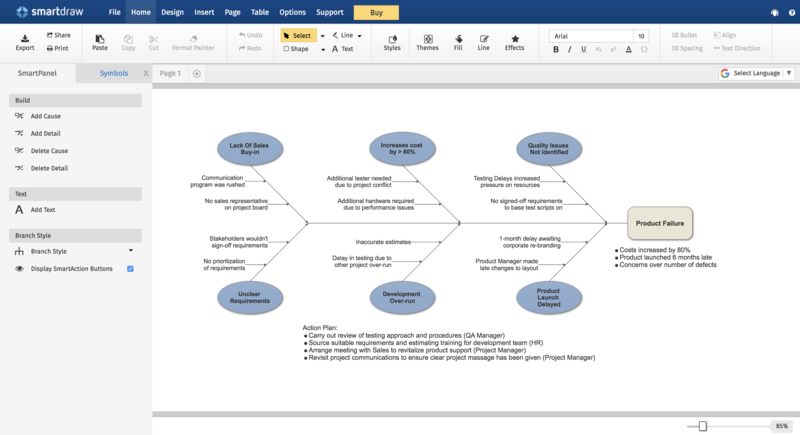 In opposite to Visio Online, Lucidchart can also be used for free. SmartDraw: SmartDraw lets you create chart-based, graph-based and schematic diagrams — basically anything from simple donut diagrams to sophisticated infographics. The cloud-based software is simple to use and reasonably priced. 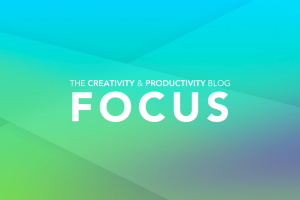 Bonus: Fluid UI: As a powerful prototyping and collaboration tool, Fluid UI lets you create simple workflows in minutes and share them with the rest of your team, who can provide feedback and edit the documents directly. Confluence: Teams working in the Atlassian environment will find a great knowledge management tool in Confluence. Here, knowledge is organized around spaces, and each space can hold all sorts of pages — anything from meeting minutes to tutorials to blog posts. Dozens of add-ons allow you to integrate even more types of assets into your spaces, such as diagrams or mind maps. MindMeister: MindMeister lets you create a net of knowledge maps that either store information locally or link to assets stored on external file storage platforms such as Google Drive or OneDrive. Mind maps are a particularly great format for knowledge management because they allow you to create intuitive models of the common knowledge (ontologies) which are easy to navigate and work with. Evernote Business: Working in Evernote is based on individual notes, which are collected in notebooks. You can also link notes together to quickly jump from one set of information to the next, or create a table of contents for a notebook. Overall, Evernote is a simple tool that’s great for collecting research and institutional knowledge. While you can technically create resource plans with a simple spreadsheet tool, there are many benefits to using specialized resource planning software with your project team. 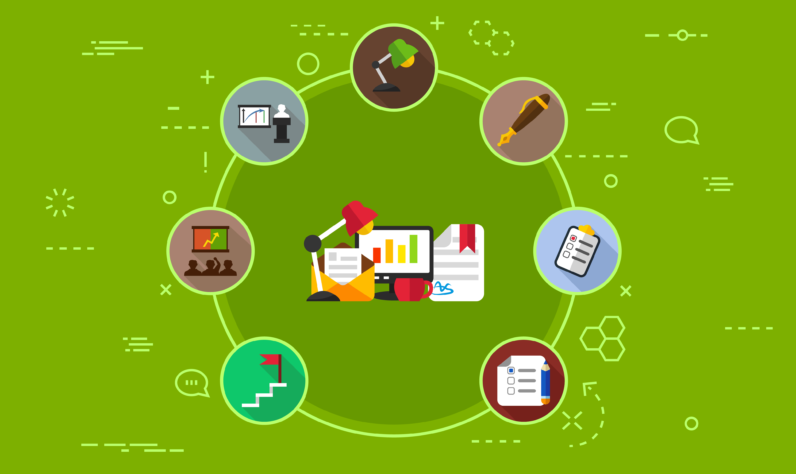 These tools usually offer interactive schedules and Gantt charts, task dependencies, time tracking and many more features that make the complex task of resource planning easier and more efficient. Forecast: Forecast uses artificial intelligence to help you schedule resources and manage projects more efficiently. 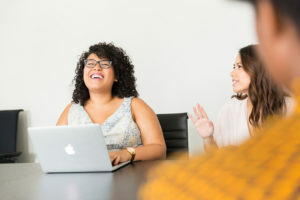 It also connects with many other popular tools project teams use, such as Slack, Drive, and various task managers. Forecast is beautifully designed and reasonably priced. Resource Guru: Compared to Forecast’s sleek look, Resource Guru’s UI and website seem a little outdated, but what the tool lacks in terms of design it makes up for with simplicity, usability and a fairly low pricing. 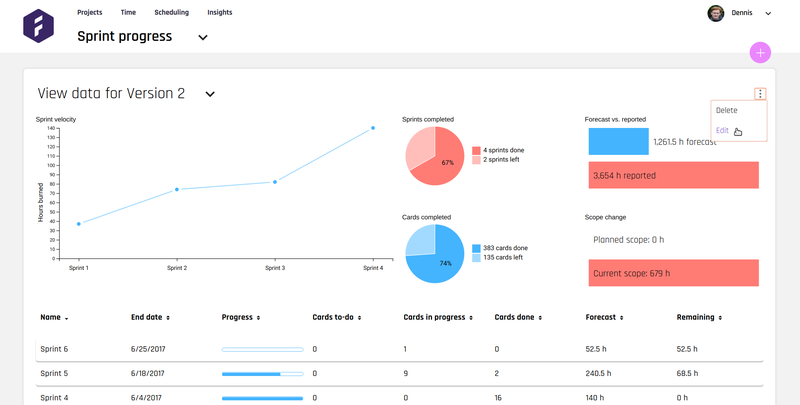 10,000ft Plans: With 10K’ Plans, you create visual, interactive resource management plans and dynamic timelines that replace your static spreadsheet schedules. Overall, 10K’ Plans is a great allrounder that includes time tracking, planning and scheduling, as well as analytics and reports. 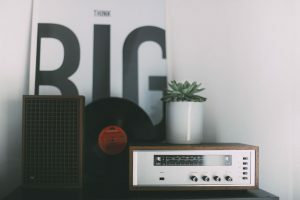 So these are our top 21 tools for project planning in 2019. If you give any of them a try, let us know how you get on in the comments below! Meister task – beautiful task management tool integrated with MindMeister, also Microsoft planner – similar features but highly integrated with Office 365 stack. Really good tools and tips, thank you for sharing! I agree with Lukasz for MS Planner, for OneNote and for: Meister Task for easy-on-the-eye European crafted and hosted task / project management tool integrated with MindMeister. Also, Todoist: powerful task manager. I’ll add the Standard Notes as a minimalistic and really good knowledge source tool https://standardnotes.org/ . Bear is also great Note Taking tool, only on MacOS and iOS for now though.